Alisha Erin Hillam grew up outside of a small Indiana town. Now she is a freelance writer drying out in Arizona with her husband and two ankle-biters. She is the recipient of several literary awards from Purdue University and, in addition to five published or forthcoming book chapters, her work has appeared in Inscape, decomP, Corium Magazine, Prick of the Spindle, and The Monongahela Review. Found poetry presents an interesting challenge: the text is set, so the poet’s decisions are limited to line and stanza breaks. 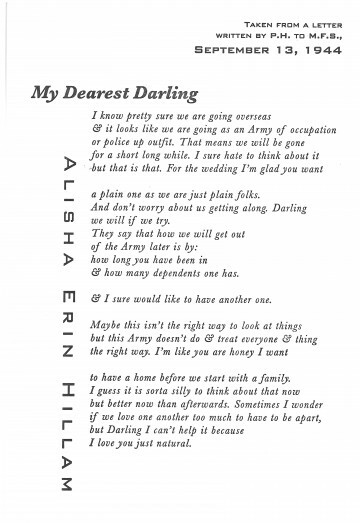 For “My Dearest Darling,” Hillam uses her lines to reinforce the letter’s emotion. As prose, “I sure hate to think about it but that is that” has a stoicism we’ve come to associate with the WWII era, but it’s amplified when combined with part of another idea, in this case the uncertainty of the duration of the war: “for a short long while. I sure hate to think about it.” Likewise “but that is that” is tempered by the gratitude of “For the wedding I’m glad you want.” A little further on the poet gives “& I sure would like to have another one” its own stanza, allowing the desire for children to reverberate separately from the logistics of military service that precede and follow. It’s an effective way to signal the heart of the poem. Life persists, Hillam reminds us, even in wartime. Especially in wartime. Military service hangs over this letter, so the design needed to have a more regular, regimented feel than a handwriting typeface could offer. And yet it is also deeply personal. Baskerville bridges those two worlds, while Bank Gothic suggests a Teletype draft notice. The poet’s name runs down the side like the stripe on dress uniform trousers.